Spending time with your family is important, but it’s hard to find something that everyone will enjoy and even harder to schedule family time. If you don’t schedule your family time now, it may not happen, so leave it up to the Ducks! Ducks games are fun for all, and an affordable ($10/ticket), convenient mini plan sets your family time in stone. Our mini plans offer the best family entertainment value on Long Island! All mini plan packages include a voucher for a FREE ticket to any Ducks regular season game, subject to availability! 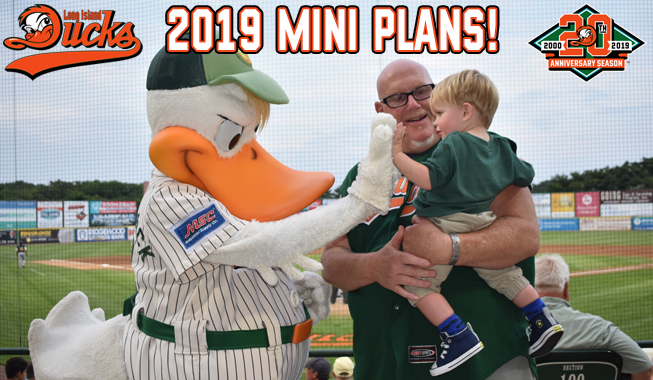 2019 Mini Plans are now on sale! CLICK HERE to view all of the packages and to submit an order form. Fans can also call (631) 940-3825 to speak with a Ducks ticket representative.